EDIT: I won't have access to my pc next few hours. We are at 18 upvotes, so probably 20 very soon. As promised, here is the written guide! Good luck on ladder! This is a token deck. Your opponent is forced to trade his minions with yours, because they are always scared of Power of the Wild, Savage Roar etc... You usually play minions or spells that will summon minions in the early game. If you have the choice between clearing an opponent's minion or fill your own board with minions, and you have an hard time to decide. Then go for tokens instead of removal, it's usually better. The only exception is where you get really good value from your Swipe. Also you should push for face damage, to setup for your combo. Especially with Soul of the Forest on your minions, you have no reason to trade(most of the time). Your starting hand(without coin) would be Acornbearer, Dreamway Guardians, Landscaping. If you have Dreamway Guardians, Landscaping, Wispering Woods, don't hard mulligan for the Acornbearer, you can just keep everything. Your starting hand (with coin) would be Acornbearer, Dreamway Guardians, Landscaping, Wispering Woods. If you have Dreamway Guardians, Landscaping, Wispering Woods and something useless... Just keep the 2, 3 and 4 mana card and mulligan the other card. EVIL Cable Rat should also kept in your starting hand. I never keep Crystalsong Portal, because we need early pressure with minions on board and second reason, druid minions are usually high mana cards. Keeper Stalladris shouldn't be played on turn 2, that's why we never keep that. Wrath on turn 2 is bad, tokens are better than removal. Keeping Soul of the Forest is like keeping priest's spellstone in starting hand and you don't have minions to play, so nothing to ressurect. I'm not going to explain why we don't keep all other cards. You get the idea. To keep it short, cards to keep: be Acornbearer, EVIL Cable Rat, Dreamway Guardians, Landscaping, Wispering Woods(if you have a 2-drop and 3-drop). Keeper Stalladris could be replaced by Microtech Controller. If you are missing one Crystalsong Portal, just replace it by a Second Microtech Controller . 12 games it's not even a sample, pls. I think that version with at least one giant and with deathrattle minions generating more tokens on field, are better in the meta as it is...today. Thank you good sir my Hearthstone experience was never so EZ PEZ SMOrc FACE haHAA before. Btw can someone tell me what can I put instead of Archmage Vargoth? Currently 15- 8 with this version. This deck is great and it sends a positive message for the environment. As everyone is aware, trees poop out oxygen (which we need to survive). I just killed a mage on turn 5... Turn 5. Thank you, trees. Actually, it was thanks to the Wisps and Savage Roar. I'm not sure what Wisps poop out, though. Thanks for taking the time to write out how to pilot the deck, and for the video. Informative stuff! By the way, if someone goes 0-5 with this deck, you're probably 100% potato. I'm roughly 31% potato, I would say. 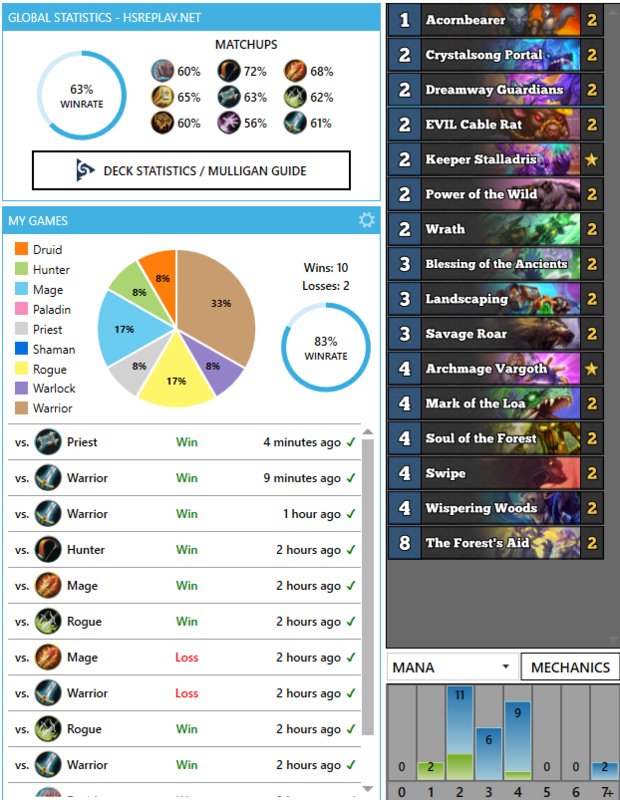 Rogues atm have way too many ways to out tempo you and clear your board multiple times, so far withing a sample of about 20 rogues I'm at about 40 % winrate against them, cause of some reason Blizzard/Flamestrike/Hellfire are a realy common spell they get and they have many ways to discover answers, let alone that you realy strugle to compete in tempo with them unless they draw poorly, so enlighten us how can we not misplay against Rogues. Token Druid is insane right now. Either you're getting super unlucky with match-ups or you are misplaying. I used this deck for Brawlesium and literally only lost to warrior. 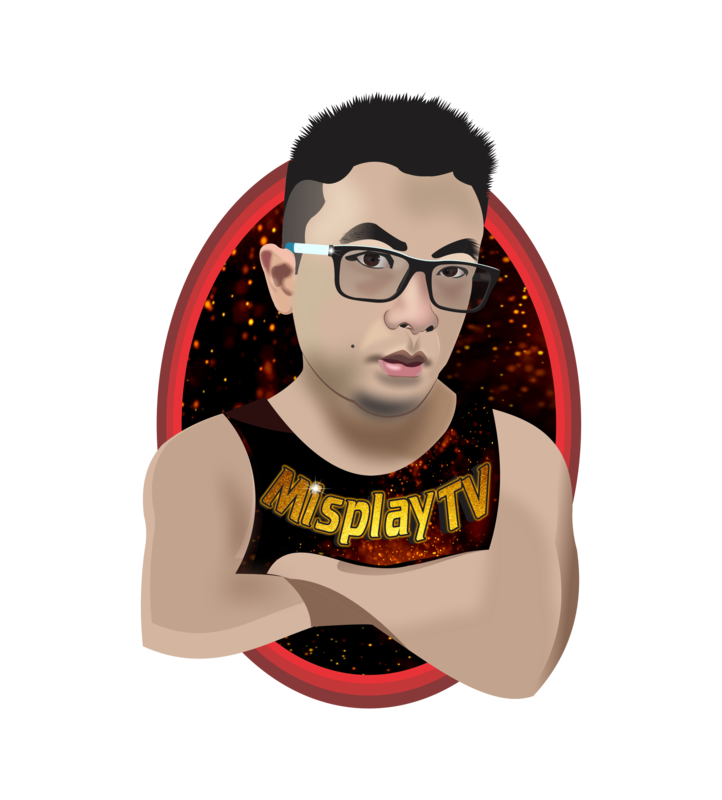 Thanks Misplay TV for the deck. I replaced Keeper Stalladris with Microtech Controller like you suggested and it works fine. Thanks for your guide and very useful video. All of the HS youtubers you are the one that really clearly explains how to pilot the deck including all the dos and don'ts. 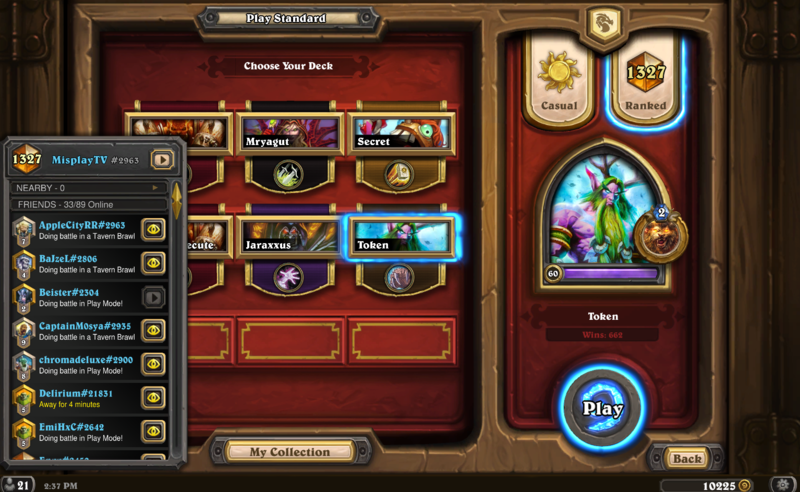 Got an 11 winstreak on this deck from rank 14 to rank 9 in one day. Pretty cool! I might take out a portal and put in something like spellbreaker for Edwin or maybe add a Dendrologist as my rank gets better. Currently I'm playing with floops glroious gloop and 1 giant. Treespeakers are too slow, if you would get value from them, you would already win the game with soul of the forst or other combo. I also tried with Treespeakers, Misplay tv is right, too slow value. Sometimes it works, but not enough.